It is time to push aside all my barriers and get back to painting miniatures. As much fun as it is to just play video games I always end up missing painting and wishing the past few months had been spent in that pursuit. I’ve resolved my vision issue with a cheap set of magnifiers, I had new brushes and will be buying a nice paint mixer to deal with my badly settled Vallejo paint. There is nothing to stop me know. BMG Joker from Knight Models. Painted by Tyler Provick. Well, except it looks like I won’t be playing the Batman Miniature Game for a while. The local store moved their Knight Models Night from Wednesday to Thursday which doesn’t work well for me. If I want to play the game I’ll need to paint up two sides and convince a friend to give it a try. Also means I’ll be on the hook for terrain and two sets of counters and whatnot. At least I’m back on track painting the Joker. Even with the new visor I am still not feeling that I’m reaching my full painting potential. I’m hoping that this is merely a case of rust and practice will sort me out. 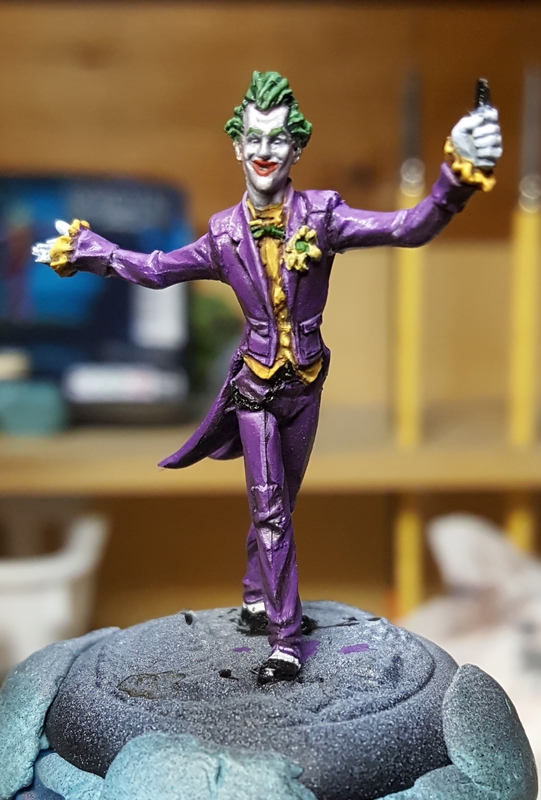 I think I really struggled because I’m not capable to painting the Joker to the level I had wanted when I started my Batman Miniature Game project. If I was painting something to a lower level I don’t think I would have been so discouraged. Thankfully the Joker is a simple model. The purple suit was the largest and most difficult part of the miniature, followed by the face and hair. Not having endless details to worry over was a relief. I decided to avoid the frustration of painting the pinstripes of the original studio paint job. I’m not confident enough to manage the fine lines without making a mistake, and a mistake like that would be an easy excuse to go back to video games.